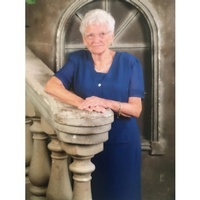 Lezzetta I. Scott of Frostproof, Florida passed away Thursday, March 28, 2019 at the Oaks of Avon. She was born May 27, 1930 in New Plymouth, Ohio to the late Harry and Freda (Henderson) Dicken. She has been a resident of the area since 1975 coming from Ohio. She was a Selector for Anchor Hocking. She is preceded in death by her husband Vern Scott and 4 brothers. Survivors include her daughter Sharon Adams and husband Clyde of sugar Grove, OH, sons Randy Scott and wife Susan of Babson Park, FL, Jerry L. Scott and wife Brenda Newark, OH; grandchildren, Doug Adams, Paul Adams, Tony Adams, Kim Adams, J.D. Watkins, Whitney Brown, Dalton Scott, Leslie Cowles and Taylor Dickinson; 9 great grandchildren, numerous great- great grandchildren. Visitation will be held 1:00PM Wednesday, April 3, 2019 until service time at 2:00PM at the Marion Nelson Funeral Home in Frostproof. Interment will be held at the Silver Hill Cemetery.